I did have quite a lengthy blog this week for the WA state elections tomorrow. Not for the first time, my computer has decided to corrupt the file, so I'm re-typing this whole thing in one night. What you are getting is a quick summary of my predictions, minus the fat and a lot of the detail that I would have liked to include. My predictions have been reformed out of fresh data and my own memory, and are less justified and probably less accurate than I had hoped. Those who live by the computer, die by the computer I guess. Not displayed above are the four independents' seats. 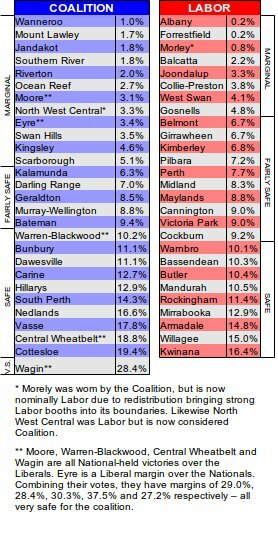 Alfred Cove (0.2% against the Liberals), Kalgoorlie (3.6% against the Nationals) and Fremantle (formerly Greens 4% against the ALP) are all marginal. Churchlands (22.5% against the ALP) is very safe, but the incumbent is retiring. I had planned to include the data regarding primary vote leads for comparison as discussed last week. That was a lot of data and I won't be able to recreate it tonight. Luckily that was the less-useful half of my predicting power because I struggled to find a way to make it comparable to the Mackerras results (so that 'safe' and 'marginal' mean roughly the same thing in both contexts). I'll return to that particular topic in another post once I have reconstructed some useful data, so that will shorten this post considerably (and save you a lot of my nattering). So far we have not looked at polling for the Federal election, and I'm sure I'll devote several posts to that in the future. The most recent polling I can find for WA has the Coalition at 54%, Labor at 32%, the Greens at 8% and 6% for 'others'. For most people reading a Sunday newspaper this would be sufficient to predict a Coalition victory, but I'm guessing if you are reading this you are not one of those people. The following illustrations were made when this data had not yet come out. It is based on the proportions of Coalition 51%, Labor 35% and the Greens and others as above. Because of the effect of district boundaries, a 51% of the primary vote does not necessarily equate to victory. 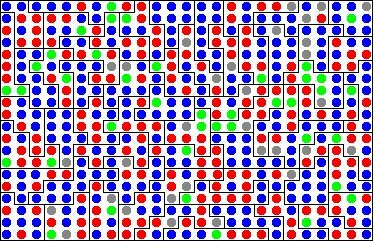 Using the proportions above, the dots were assigned colours randomly using this random array generator. I do not have the original values since the crash, but the lowest 51% of the 500 numbers were coloured blue (Coalition) the next 35% red (ALP) the next 8% green (Green) and the rest grey. On primary votes this should be a clear victory for blue, yet when divided along the borders that I deliberately gerrymandered, red wins quite comfortably. 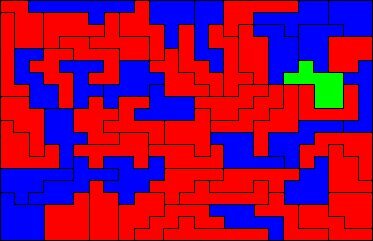 This is probably not the best-possible gerrymander for Labor, but it is a very good one. It illustrates the danger of extrapolating a general voting pattern across the board - a strong swing like the one to the Coalition in the 2010 federal election can do very little if it is mostly contained in safe seats. With that caveat, I should point out that seat-by-seat polling is very rare because it is difficult to conduct and time consuming. Instead we will approximate a solution. This time last election the poll gave Labor 35%, the Coalition 43%, the Greens 12% and others 10%. The ALP is down three percentage points since then and the Coalition is up 11. While this may still be mostly lost in the safe seats, it does at least take into account the constants of dedicated, 'rusted on' voters (and thus the most staunchly unbending seats) and gives us an indication of the general swing of opinion. On two-party preferred polling (2PP polling) there is a 7% swing to the Coalition. Since I don't have my primary vote data any more, I'll have to rely on this almost entirely for my predictions. As for the upper house, this is almost entirely based on primary vote data. As a result I'm afraid I'm going to have to give you my predictions from memory without any real explanation. Anyone who wants to see my upper-house methodologies is going to have to wait until I cover the federal election, but basically it is based on the primary vote from last election and the general swing in primary votes (assuming people's primary vote in the Assembly broadly reflects their Council votes). There was also a nice little bit of numerical wizardry I implemented to determine where the swinging voters were most concentrated which only really works with the WA system. I'm afraid you're going to miss out on that. 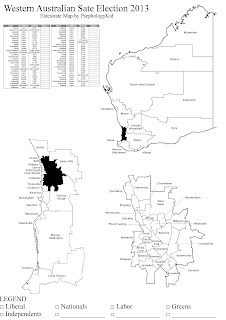 So, WA is divided into 6 regions: Northern Metropolitan, Southern Metropolitan, Eastern Metropolitan, Agricultural, Mining and Pastoral and South West. 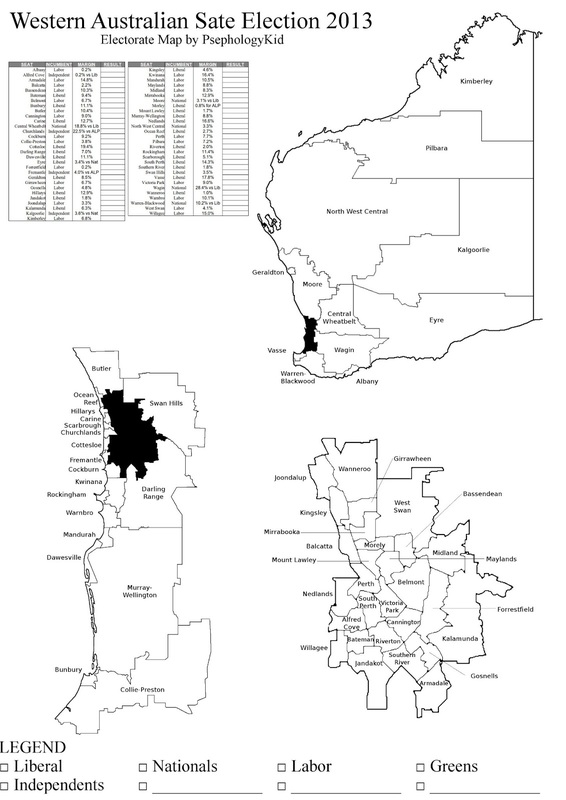 Each region elects six councillors. Currently the councillors are divided 21 Coalition (16 Liberal, 5 National), 11 Labor and 4 Greens. For a rough, back-of-an-envelope guide, we could divide each party's number of councillors by the 2008 primary vote to get a councilor-to-primary-vote ratio, and then multiply that by the 2013 polling figures. This, adjusted slightly to keep in with the 36 available positions, gives roughly 25 Coalition councillors (20 Liberals, 5 Nationals), 9 ALP and 2 Greens. An overall majority in the lower house for the Coalition is pretty well expected universally, although of course the Coalition still insists it is close so that voters feel that the Liberals and Nationals need their vote and will not waste it on some Independent. A gain of 1 seat would give them a majority (30/59 seats) and I'm predicting around 9 seats gained, based on marginal seats taking a swing in the region of 5%. If the Coalition was not returned it would only be the fourth single-term government since party politics really started in WA. The others were the Scaddan Labor ministry in 1914, the second Mitchell Ministry in 1933 and the Tonkin Labor ministry in 1974. 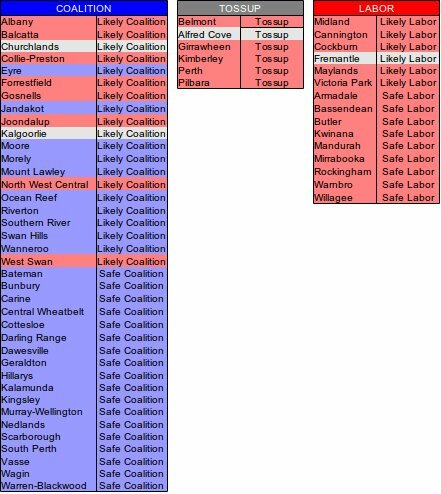 Total Predicted: 24 Coalition, 8 Labor, 4 Green. Hey, I have moved from Adelaide to Perth and have noticed that there are very few election signs put up around streets and such, to the point that we may have forgotten to vote if not for a chance encounter. Is there a law prohibiting such advertising in Perth? I remember it being all over the place in Adelaide. Having lived in South Australia all my life I know exactly what you mean. I am not aware of any state laws affecting the display of signage, and the news coverage we are getting here shows plenty of banners in places that appear to be reasonably close to the polling booths, so it would seem unlikely that street signage is banned. Normally signs and how-to-vote cards at polling places are the first to be banned. Apparently signs are everywhere in the Pilbara area, too. In December the Liberal Party took the City of Armadale to court for refusing to allow election signage and won, with tens of thousands of dollars awarded in costs. Their argument was based on the Australian Constitution's implied right to political communication, so if there was a ban in your area I would expect it to have been challenged. If you are in the seat of Perth, which I consider one of the key battlegrounds, I am very surprised that there is no signage. If you are in South Perth, a very safe Coalition seat, they may not have bothered. That would seem very arrogant/defeatist to me, and I can't believe that signage would be that expensive so this seems unlikely. The other option, of course, is vandalism.